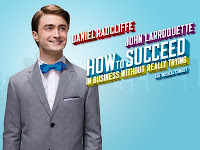 I enjoyed seeing the new Broadway revival How to Succeed in Business Without Really Trying at the Al Hirschfeld Theatre a couple of weeks ago courtesy of a press invite. My initital response was remains that it was a really fun time in the theatre. It's exhilerating to be a part of large audience completely engaged by the action on stage. This audience was loud with enthusiasm and appreciation, which really lent to the fun atmosphere. 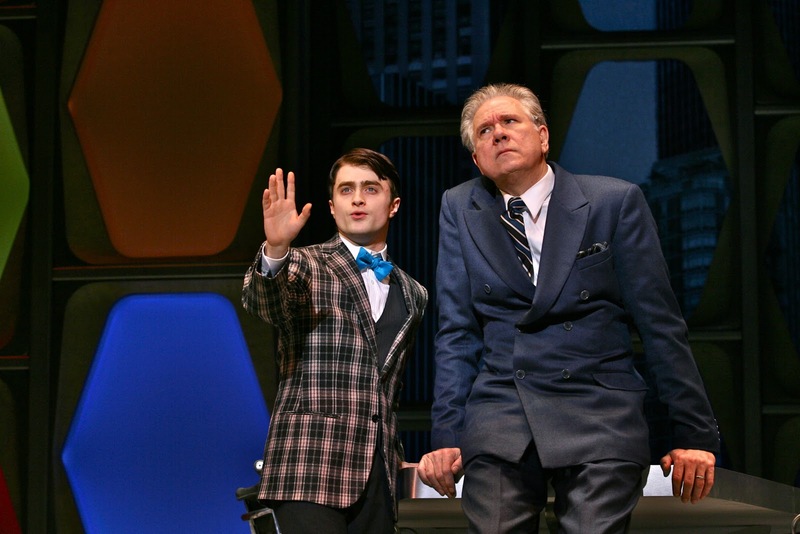 The revival, which celebrates the 50th anniversary of the original Broadway production that won the Pulitzer Prize and a slew of other awards, stars Daniel Radcliffe as J. Pierrepont Finch and John Larroquette as his boss J. B. Biggley. Radcliffe is making his Broadway musical debuts and Larroquette his Broadway debut and where they lack in vocal prowess, they make up for in charm and comedic timing. Additionally, Radcliffe is pretty hot stuff in the steps department. Speaking of the steps department, director and choreographer Rob Ashford moves the the rather long show (the first act is almost 1.5 hours long) at a quick pace. Lending to the look of the show are the costumes by Catherine Zuber who turns the dresses into eye candy. The show is old-school cliché and takes you all the way back to 1961. But it's easy to overlook its pre-feminism book, because it's so much fun. Tammy Blanchard as Hedy La Rue is particularly responsible for this when she delivers with side-splitting hilarity. She's straight out of an old movie. The rest of the cast is sweet, Rose Hemingway in her Broadway debut as Rosemary, Christopher J. Hanke as Bud Frump, Rob Bartlett as Twimble/Wally Womper, Mary Faber as Smitty, Ellen Harvey as Miss Jones and Michael Park (hooray for As the World Turns alum!) as Bert Bratt. The story is that J. Pierrepont starts his career as a window washer and climbs all the way to the corporate top in a very short amount of time. It's silly but believable. Frank Loesser's score is one to love and although I'm glad to hear that this production will get a recording for posterity sake, the original and the 1995 revival cast albums will remain revered in my collection. This is a show for any fan of big Broadway and I'd see it again any time. It plays at the Al Hirshfeld on 45th Street. There are no offered discounts at this time, but if you get to the box office early in the morning, $30 rush tickets are available on day of performance when box office opens.